EXOR is one of Europe’s leading investment companies and is controlled by Giovanni Agnelli e C. S.a.p.az., which holds 51.39% of ordinary share capital. Listed on Borsa Italiana’s Stock Exchange with a Net Asset Value of approximately €10 billion at March 31, 2014, EXOR is headquartered in Turin, Italy. EXOR makes long-term investments focused on global companies in diversified sectors, mainly in Europe and in the United States. EXOR’s objective is to increase its Net Asset Value and outperform the MSCl World Index in Euro. (a) EXOR holds 40.15% of the voting rights. In addition, Fiat holds a 2.49% stake and 2.83% of the voting rights. (b) Stake equal to 82.35%. Fiat (30.04% of share capital) is listed on the Mercato Telematico Azionario (MTA) managed by Borsa Italiana and is included in the FTSE MIB Index. Founded in 1899, Fiat is today an industrial group with a global reach also through the integration with Chrysler. Fiat is an international auto group engaged in industrial activities in the automotive sector through companies located in 40 countries and has commercial relationships with customers in approximately 150 countries. The Fiat designs, engineers, manufactures, distributes and sells vehicles for the mass market under the Fiat, Alfa Romeo, Lancia, Abarth and Fiat Professional brands and Chrysler brands such as Chrysler, Jeep, Dodge and Ram brand vehicles and vehicles with the SRT (Street and Racing Technology team) vehicle performance designation, as well as luxury cars under the Ferrari and Maserati brands. Fiat also operates in the components sector, through Magneti Marelli and Teksid, and in the production systems sector, through Comau and in after-sales services and products under the Mopar brand name. Fiat’s operations relating to mass market brands of passenger cars, light commercial vehicles and related parts and services are run on a regional basis and attributed to four regions representing four geographical areas: NAFTA (U.S., Canada and Mexico), LATAM (South and Central America, excluding Mexico), APAC (Asia and Pacific countries) and EMEA (Europe, Russia, Middle East and Africa). At December 31, 2013 Fiat had 159 factories and 225,587 employees throughout the world. CNH Industrial (27.11% stake. 2.49% stake also held by Fiat) is listed on the New York Stock Exchange (NYSE) and the Mercato Telematico Azionario (MTA) managed by Borsa Italiana and is included in the FTSE MIB Index. Operational since September 29, 2013 when the merger between Fiat Industrial S.p.A. and CNH Global N.V. was completed, CNH Industrial’s goal is the strategic development of its business. The large industrial base, a wide range of products and its worldwide geographical presence make CNH Industrial a global leader in the capital goods segment. Through its brands, the company designs, produces and sells trucks, commercial vehicles, buses and specialty vehicles (Iveco), agricultural and construction equipment (the families of Case and New Holland brands), in addition to a broad range of powertrain applications (FPT Industrial). Each of the CNH Industrial Group’s brands is a prominent international player in the respective industrial segment. 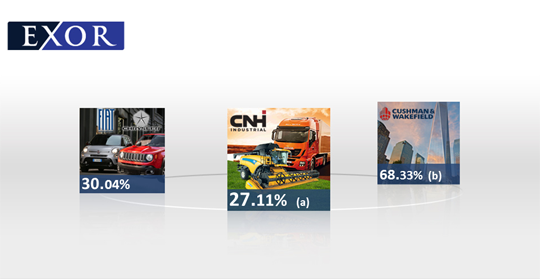 At December 31, 2013 CNH Industrial was present in 190 countries giving it a unique competitive position across its 12 brands, 62 manufacturing plant, 48 research and development centers and more than 71,000 employees. C&W Group (68.33% of share capital) is a world leader in commercial real estate services. C&W Group has its headquarters in New York, where it was founded in 1917. It currently has approximately 250 offices and more than 16,000 employees in 59 countries. Almacantar (38.29% of share capital) is a company engaged in the real estate sector for commercial investment and development opportunities, for offices and residential units, situated in London. Juventus Football Club (63.77% of share capital) is listed on the Mercato Telematico Azionario (MTA) managed by Borsa Italiana. Founded in 1897, it is one of the most prominent professional football teams in the world. Gruppo Banca Leonardo (17.37% of share capital) is a privately held and independent international investment bank offering a complete range of advisory and private banking services and other areas connected to the financial markets. Banijay Holding (17.09% of share capital) is headquartered in Paris. The company is a new player in TV production through a network of companies specialized in the production and distribution of multimedia content. The Economist Group (4.72% of share capital) is a company with its center of operations in London and head of the editorial group that publishes The Economist, a weekly magazine that with a global circulation of more than one million copies represents one of the most important sources of analysis in the international business world.